Spring MVC is the Spring framework's traditional library for building Java web applications. It is one of the most popular web frameworks for building fully functional Java web applications and RESTful web services. In this tutorial, you'll get an overview of Spring MVC and learn how to build Java web applications using Spring Boot, Spring Initializr, and Thymeleaf. We'll fastrack our Spring MVC web application with the help of Spring Boot and Spring Initializr. Given input for the type of application to be built, Spring Initializr uses the most common dependencies and defaults to setup and configure a basic Spring Boot application. You can also add custom dependencies and Spring Initializr will include and manage them, ensuring version compatibility with both third-party software and Spring. Spring Boot applications run standalone, without requiring you to provide a runtime environment. In this case, since we're building a web application, Spring Boot will automatically include and configure Tomcat as part of the app's runtime. We can also customize the app by adding an H2 database driver to our Maven POM file. Spring Boot will then automatically create an embedded database and DataSource instance in the application context. Once the dependencies are set, Spring Boot will provide default configurations for the application. Of course we can change the configurations if we want to, but thanks to Spring Boot we have a headstart: a fully configured, working application right out of the box. Once we've selected and configured our dependencies, we'll pass those selections to Spring Initializr, which will provide a downloadable ZIP file containing a base Spring Boot project. We'll start by creating a basic Spring MVC web application that persists data to an H2 embedded database. Navigate to Spring Initializr at start.spring.io and select Generate a Maven Project with Java and Spring Boot 2.0.X, where X is the latest Spring Boot version (2.0.3 at time of this writing). Make sure you select Spring Boot 2.x so that you can implement Spring Web MVC 5. Spring Boot 1.4 and Spring Boot 1.5 will implement Spring 4. Enter a group name with the format matching your web address, such as com.geekcap.javaworld, and enter an artifact name, such as spring5mvc-example. Figure 1 shows my configuration. When you're finished, click the Generate Project button at the bottom of the page. Spring Initializr will create a readymade ZIP file with all the required project sources, which you can download. Extract the ZIP file from Spring Initializr, then import the project into your favorite IDE. For example, to import the project into IntelliJ, choose File-->New Project, as shown in Figure 2. Next, navigate to Import project from external module, choose Maven, and press Next. Be sure to choose a Java 1.8 project SDK, then hit Finish. 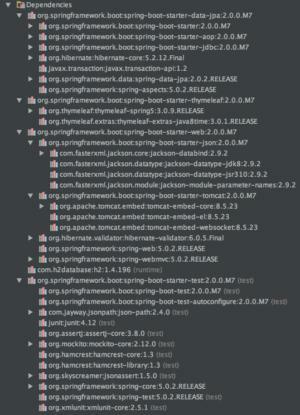 Now let's take a look at the Spring Boot starter application that has been generated by our (minimal) efforts so far. To start, Listing 1 shows the Maven POM file. Notice that the POM file uses a special parent POM: spring-boot-starter-parent. We'll use the parent POM to manage the versions of all our dependencies and ensure versions are compatible. The repositories at the end of the POM file reference the Spring snapshot and milestone repositories. We need these because Spring Boot 2.x is still a milestone release at the time of this writing. Each of these starter dependencies brings in all of the sub-dependencies it needs. Figure 3 shows the partially expanded dependency view in IntelliJ. spring-boot-starter-data-jpa includes Hibernate and Spring Data. spring-boot-starter-thymeleaf includes the Thymeleaf template engine. spring-boot-starter-web includes spring-boot-starter-tomcat, an embedded version of Apache Tomcat. spring-boot-starter-json includes the Jackson JSON libraries. spring-web and spring-webmvc includes Spring MVC. spring-boot-starter-test includes testing libraries such as JUnit and Mockito. When Spring Boot sees these dependencies in the CLASSPATH, it initiates automatic configuration. For example, when it finds spring-boot-starter-web, it creates an embedded version of Tomcat, and when it finds H2 and spring-boot-starter-jpa it creates an H2 embedded database and a Hibernate EntityManager. 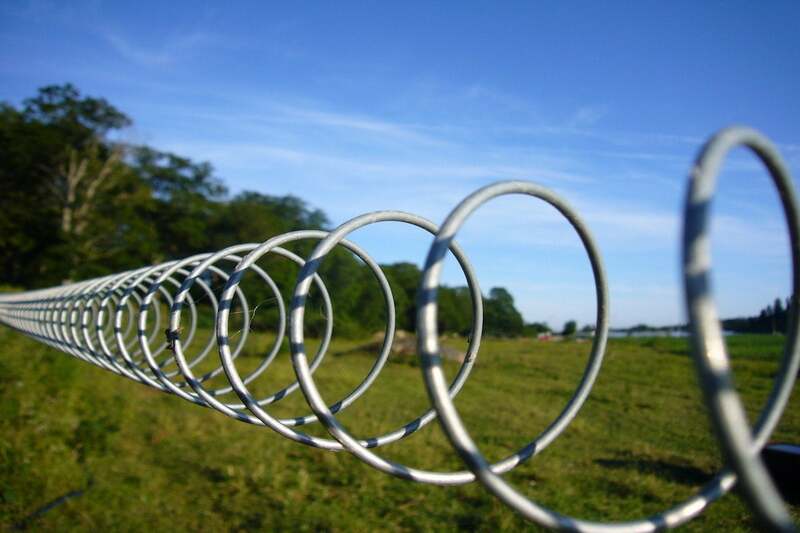 It then wires the EntityManager into Spring Data. Spring Boot also creates a single class that can be used to run the application. The class for the example application is shown in Listing 2. @EnableAutoConfiguration tells Spring to automatically configure resources from dependencies found in the CLASSPATH, such as H2 and Tomcat. @ComponentScan tells Spring to scan packages in the CLASSPATH under the current package (com.geekcap.javaworld.spring5mvcexample) for Spring-annotated components such as @Service and @Controller. Spring scans the CLASSPATH and automatically creates components such as the embedded Tomcat server and H2 database. It then populates the Spring context with the application components found in the package scan. In essence, Spring Boot makes it very easy to select and configure the services, components, controllers, entities, and so forth that you need for your application. Once you've done that, Spring will automatically find them, make them available in the Spring context, and autowire everything together. We've got our Spring Boot starter project setup and ready to go. In the next section we'll create the Spring MVC components for our Java web application. What is the Spring context? The Spring context is a registry of all available Spring beans. Classes are identified as Spring beans by annotating them with specific Spring annotations. Examples include @Service, which identifies a business service, @Controller, which identifies a Spring MVC controller (i.e., handles web requests), and @Entity, which is a JPA annotation used to identify classes that are mapped to database tables. Once these beans are annotated they need to be registered with the Spring context, which Spring Boot does by performing a package scan of all classes in packages in your project. As the Spring context is being built, it implements the inversion-of-control (IoC) design pattern through dependency injection: when a Spring bean needs a dependency, such as a service or repository, the bean can either define a constructor that accepts the dependent bean or it can leverage the @Autowired annotation to tell Spring that it needs that dependency. Spring resolves all dependencies and "autowires" the application together. Dependency Injection is a powerful design pattern because, rather than creating and managing dependencies inside your code--which can be messy and leads to tightly coupled classes--you can instead delegate control to the Spring container. Your class simply tells the container what dependencies it needs to run and the container provides the appropriate dependencies to your class at runtime. Model represents your domain objects. View renders your model to a view, such as to an HTML page. Controller sits between your view and model and translates change requests in the view into changes in the model, and vice versa. In practical terms, the controller accepts incoming requests, potentially updates the model, and sends your model objects to a "view" to render back to the client. In Spring MVC, controllers are identified by the @Controller annotation and accompanied by a @RequestMapping annotation. The annotation defines the HTTP verb (standard HTTP commands like GET, POST, PUT, and DELETE) and URI for which the request-mapping method will be applied. Spring 4 introduced shortcut request mappings, which make things even easier. We'll use these mappings--@GetMapping, @PostMapping, @PutMapping, @PatchMapping, and @DeleteMapping--for our example application. For our application, we'll define a simple model object, a Widget, store it in an embedded H2 database, and build a controller to manage widgets. Let's start with the Widget class, which is shown in Listing 3.